who use Cubit every day. Up to 3x faster than other software, or 10x faster than manual estimating. Ditch the scale ruler and trace directly over your imported plans on screen. View your takeoff in 3D to cross-reference. Don’t miss taking off items again! Leave your competition in the dust by using a tried and tested natural solution that seamlessly integrates takeoff with estimating. No two estimators work the same way, so we’ve developed Cubit in a flexible way to allow you to estimate the way you want. When you do your takeoff you’ll see your estimate update in real-time all on one screen, meaning you’ll never lose sight of the estimating process. Perform your quantity takeoff with pinpoint accuracy. At the click of a button, you can check your takeoff in 3D view to ensure you haven’t missed taking off any items. You’ll never have to second guess yourself again! 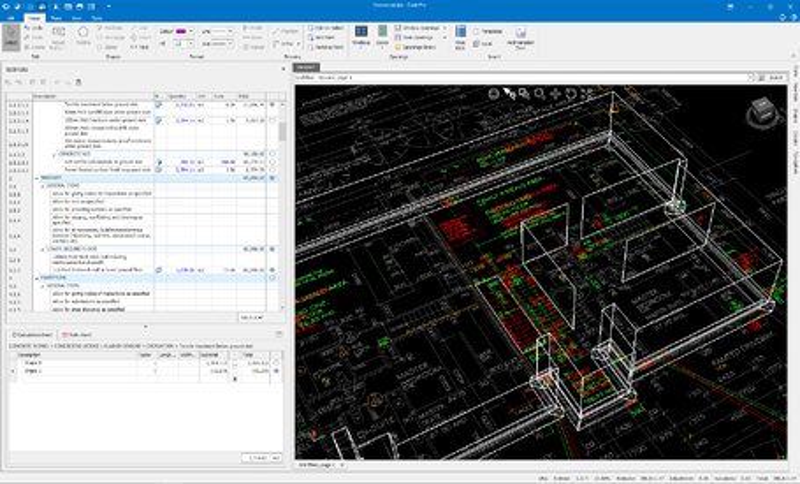 Cubit supports multiple file formats, including PDF, CAD (DWG, DXF), BIM (DWFx) and various image files. Repeated data entry is a thing of the past. Develop master price lists using the pricing information you’ve collected over time, or import pricing supplied to you. If you prefer, create template jobs with common trades and items so you don’t repeat this every time you start a new job. Any updates you make to your templates can be pushed into existing estimates, meaning you’ll work with the most up to date information at all times. Set Up in Minutes, Be Estimating in Hours. Estimating and takeoff; one seamless process. Pinpoint accurate takeoff with a view from any angle. Perform your quantity takeoff with pinpoint accuracy. At the click of a button, you can check your takeoff in 3D view to ensure you haven’t missed taking off any items. You’ll never have to second guess yourself again. 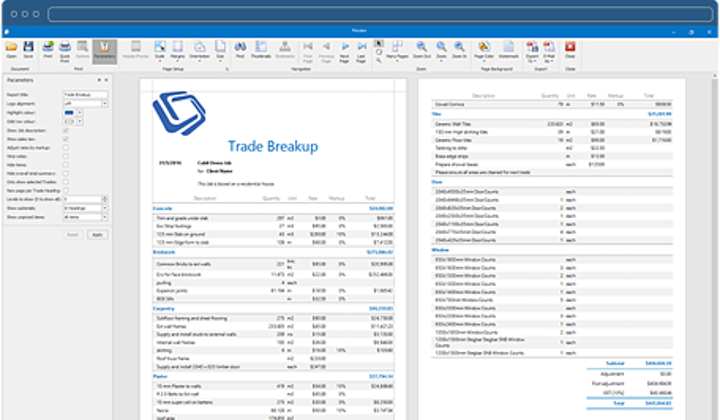 Use template price lists and jobs as the source for new estimates. 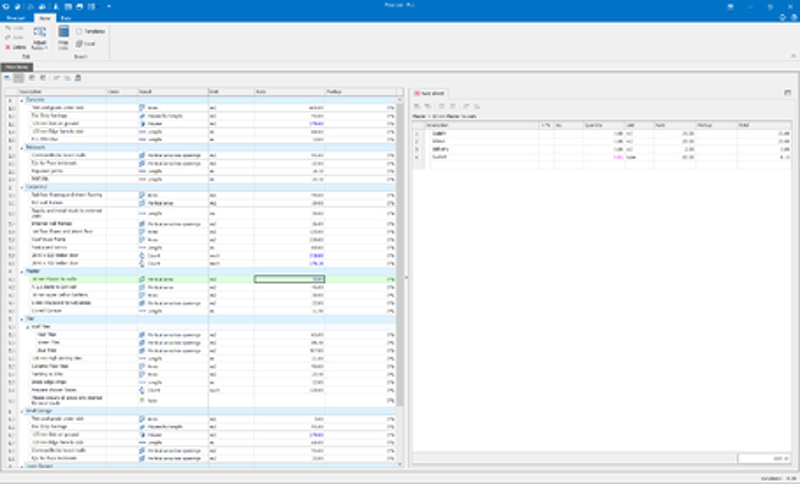 Develop master price lists using the pricing information you’ve collected over time, or import pricing supplied to you. Or, create template jobs with common trades and items so you don’t repeat this every time you start a new job. Group similar information together to increase visibility over jobs. 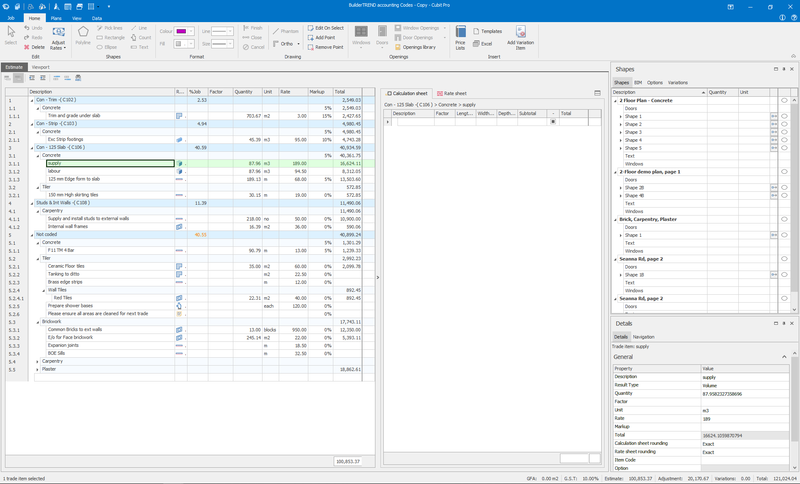 Code and sort your estimates in different formats, allowing you to break your job down by accounting code, material or labour. Export this information to other third-party applications so you can use the information across other business systems. 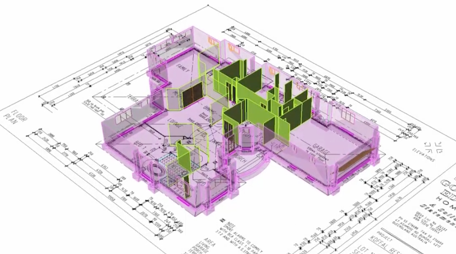 Save countless hours estimating by seeing variances between the original and revised plans. Update your takeoff to reflect any revisions and instantly update your estimate. Professional reports for you or your clients. Generate and print a range of default professional reports in common formats, including PDF and Excel. Choose Cubit Pro and you’ll be able to build and customize your own reports! We have dedicated integrations with other systems you may use across your business. We also play nice with most other systems, via CSV files. "I think that Cubit & Global Estimating are great estimating tools, easy to use and provides the user with the ability to compare many subcontractor/supplier quotes easily and effectively in a spreadsheet format. Buildsoft's phone assistance is excellent. 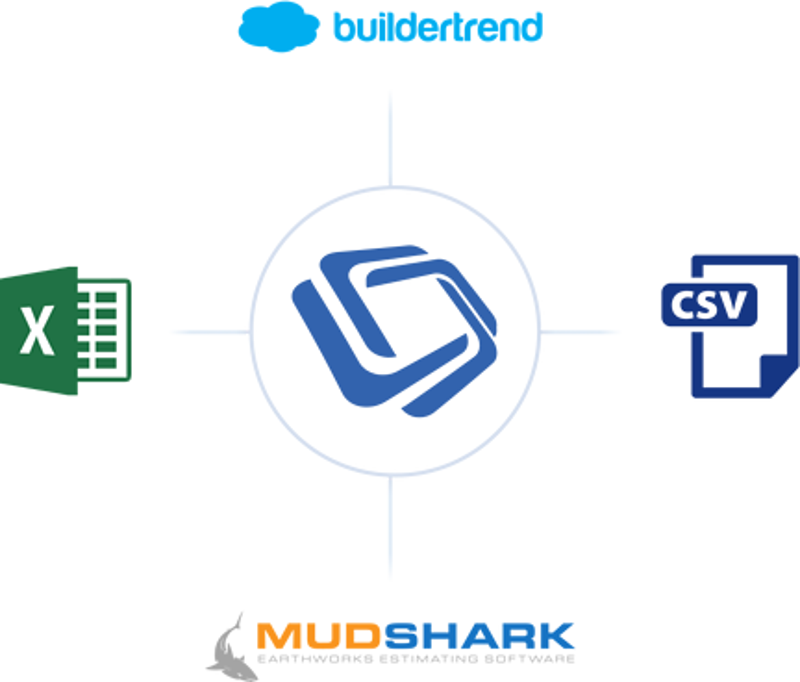 I believe if you’re not using Buildsoft, you’re not a serious Estimator." 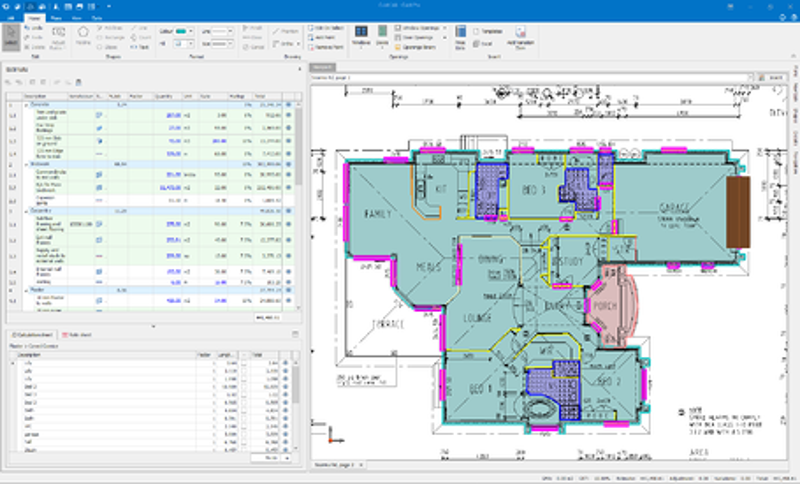 Cubit combines easy functionality with user-friendly estimating and takeoff features. All the bells and whistles, delivering a high-end estimating and takeoff solution. Try every feature, no credit card required. Fill out the form below and a Product Consultant will be in contact with you to assist with setting up your trial of Cubit.